This blog contains some earlier posts from my blog The Edge of Snowdonia. When I have transfered the old posts I will review them and add updates and other discoveries. Much of the pleasure many family historians get when researching their family is from using detective skills to discover the truth. We gather the information and piece it together so that using the genealogical proof standards we can say that given all this evidence this is what I believe to be the conclusion. I have one part of my husband's tree which has and still is proving difficult to establish. My husband's paternal gt grandmother died in Lincolnshire in the late 1960's at the age of 90. 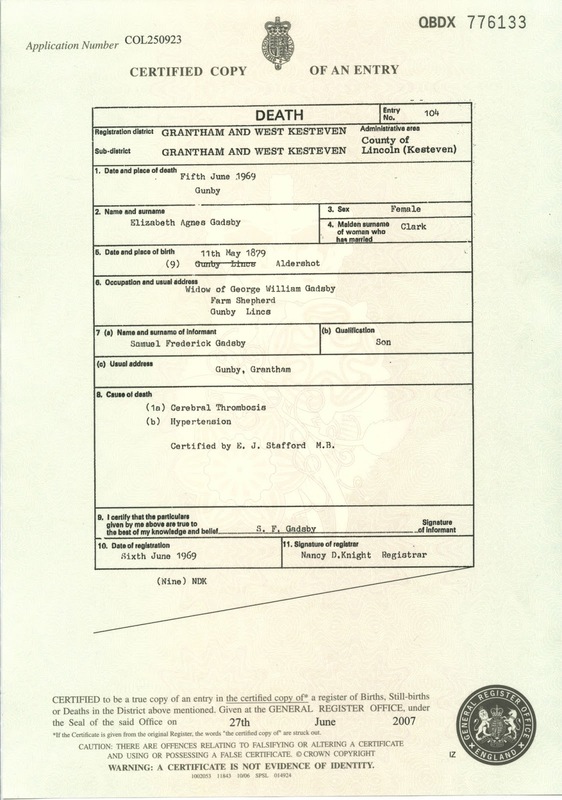 On her death certificate the place of birth had been changed, from Gunby, Lincolnshire where she died, to Aldershot and her maiden name was recorded as Clark. This information came from her unmarried son who lived with her. 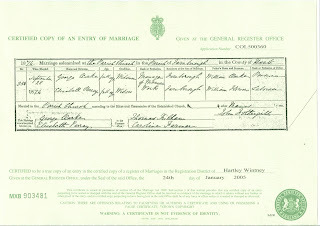 Her marriage certificate recorded her name as Elizabeth Agnes Clarke and her father as George Augustus Clarke whose occupation was Army Pensioner. The witnesses were Frederick Agustus Clarke, Samuel Gadsby, Jane Emma Gadsby and Ruth Avendar. Three of these were obviously relatives but what about the fourth one with a somewhat unusual surname. I thought nothing more about a possible connection to the family maybe she was a friend or cousin. 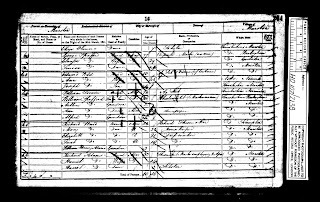 Next to find Elizabeth on the 1901 census, she had married in 1900 and was found with her husband and eldest son and her birthplace recorded as Hants Farnboro. Farnborough is on the Hampshire/Surrey border near Aldershot which is known for its connection to the British Army and fits with information found on the death and marriage certificate. 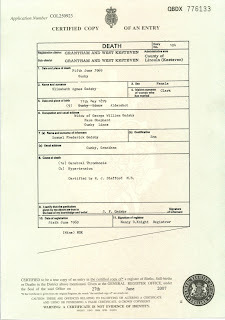 Both places are in the Hartley Wintney registration district and I found a birth registration for her and the copy birth certificate was obtained. The date of birth matched that given on the death certificate and the parents were George and Elizabeth Clarke late Perry formerly Flowers. 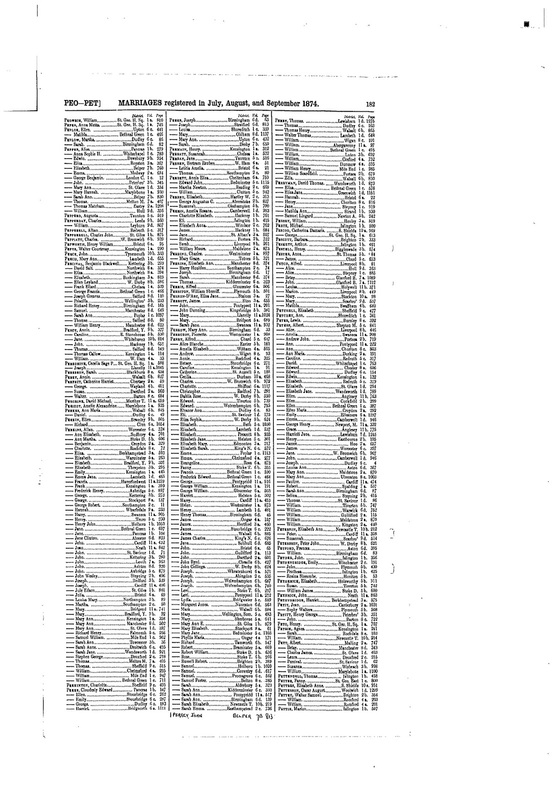 The index to the 1881 census was available on the Family search website and I found the family living in Grantham, Lincolnshire. Elizabeth had 2 older siblings Frederick and Rebecca the eldest age 5. This indicated a marriage 6 years earlier or possibly longer all the children were born in Farnboro so this was the first place to search for the parents marriage. George was recorded as being born in Ireland and his wife Elizabeth in Marston, Lincs. Their marriage had taken place in Farnborough and the church record is now available on the Ancestry website. 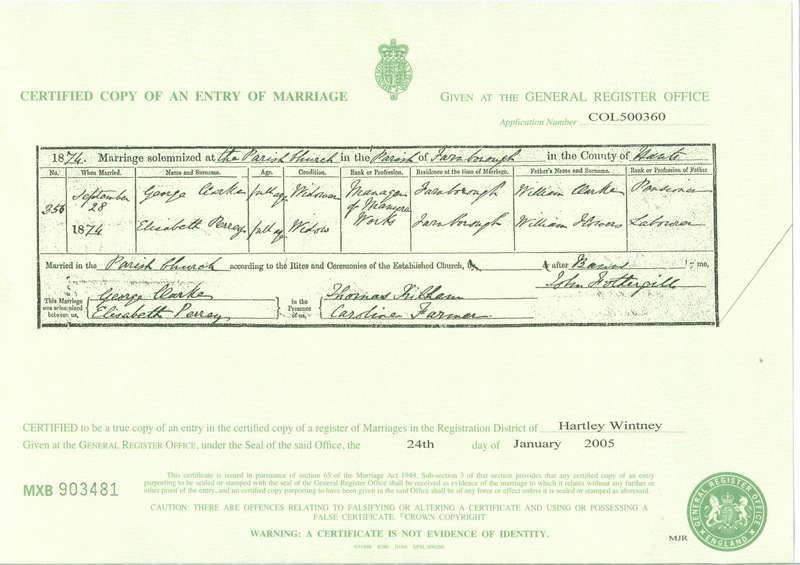 The copy marriage certificate which tallies with the church record indicates that both George and Elizabeth were widowed her surname at marriage was Perrey and their fathers were William Clarke Pensioner and William Flowers Labourer respectively. Ages were not recorded but both stated they were of full age. So far things are straightforward. 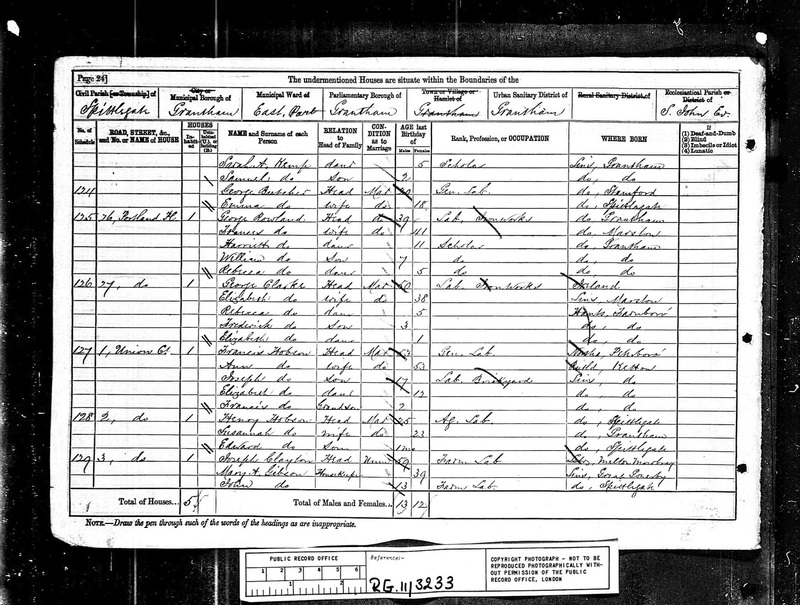 It was relatively easy to pick up Elizabeth on the earlier census with her parents. She is recorded in the 1851 census as Eliza Flowers living in Marston, Lincolnshire. 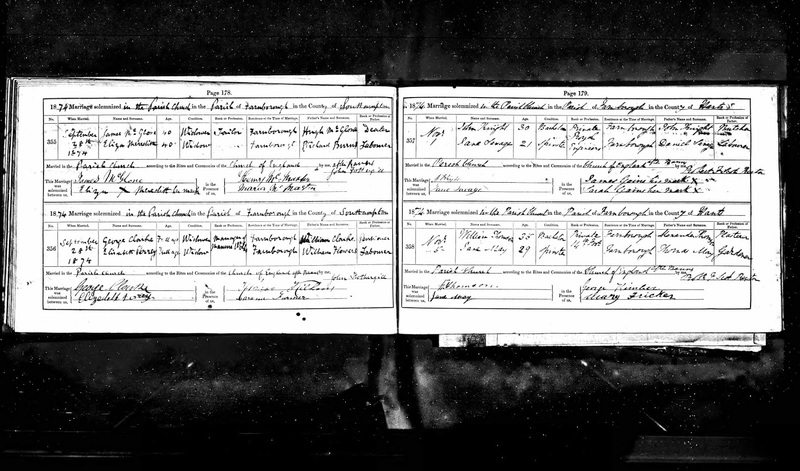 The marriage to George took place in 1874 so I needed to find her in the 1861 and 1871 census. I also needed to find her marriage to the first husband a Mr Perry/Perrey. Who was George Clarke's deceased wife? Were there any children from the previous marriages? 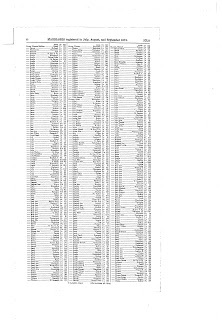 There were no older children on the 1881 census what had happened to any children from previous marriages? It may have been at this point that I made contact with a fellow researcher. She is a distant cousin, a descendant of William Flowers by a brother of Eliza/ Elizabeth. She sent me a skeleton tree that she had built of the family and I set out to confirm what she had sent was correct. At the time I was doing this research there were much less digital records available online and I had limited time to make research trips. I shall continue this in my next blog post. 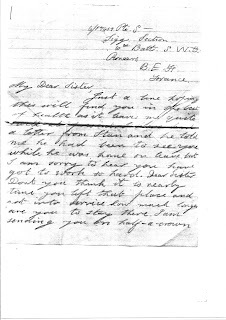 I am fortunate to have in my personal collection a letter written by my great grandmother it was written on Christmas Eve and my grandfather would not have received it for several days at least. 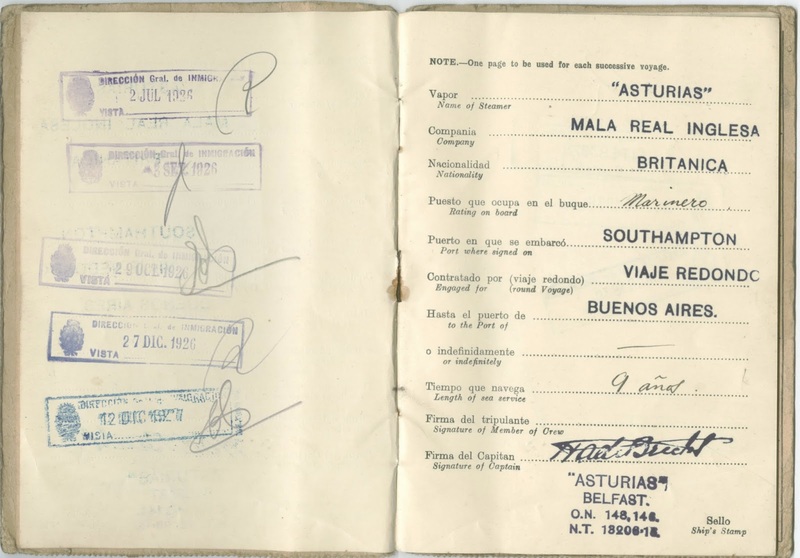 It is addressed to Mr A Buckle Deck Dept, R.M.S.P Andes, ℅ Messrs James Rawes & Co, Rna Bernardino Costa 47, Lisbon Portugal. My dear Albert just a few lines to you hope you are well we are well. but Len and me have been home all the week with a bad chill and bad throat. we have had it very cold. now it is dirty and wet. I am writing this on Christmas Eve. I am in doors all by myself. I have been to town in the afternoon and had a look round I was glad to get back for the town was crowded so I am having a quiet evening to my self Queen and Bet came down today they are all right but Queen have had a bad eye wee had a letter from Nelly to night. She says she is awful busy at the shop. I hope you will have a nice Christmas I expect we shall be Quiet on our own. As we celebrate Christmas this year I want to think about those who cannot be with their family for whatever reason and those who are without the 21st century comforts. The weather in recent days has left many in the UK without power and at risk of flooding. We also hear that others have suffered due to an Ice Storm in parts of the US and Canada. Christmas day was much calmer we could even see the sun. There are other reasons why we may not have spent Christmas with our loved ones and the same reasons may have been true for our Ancestors. 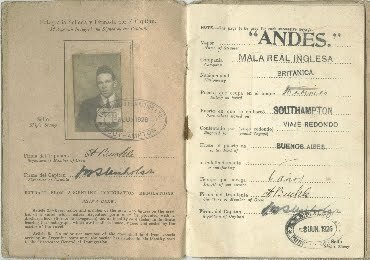 These are images of a book in my possession which details information regarding my grandfather's voyages to the Argentine in the 1920s. It is also a great source for a physical description of him. He married in 1924 but as can be seen from the dates he was away from home at Christmas and I am sure he would have been missing his family. For more information on the Andes below are a few links I have found. Please see my post A Letter from Mother at Christmas. The above picture is from the book Yesterday's Warminster by Danny Howell. I was fortunate to obtain a copy of this book which is now out of print. Now what, I hear you ask, does the above picture have to do with the title of this post. 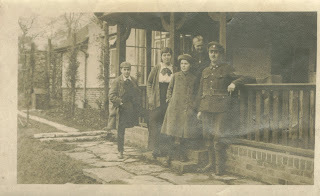 The person on the far right of this picture was Walter John Compton b 1 July 1891 and he was employed by the Warminster Co-op. 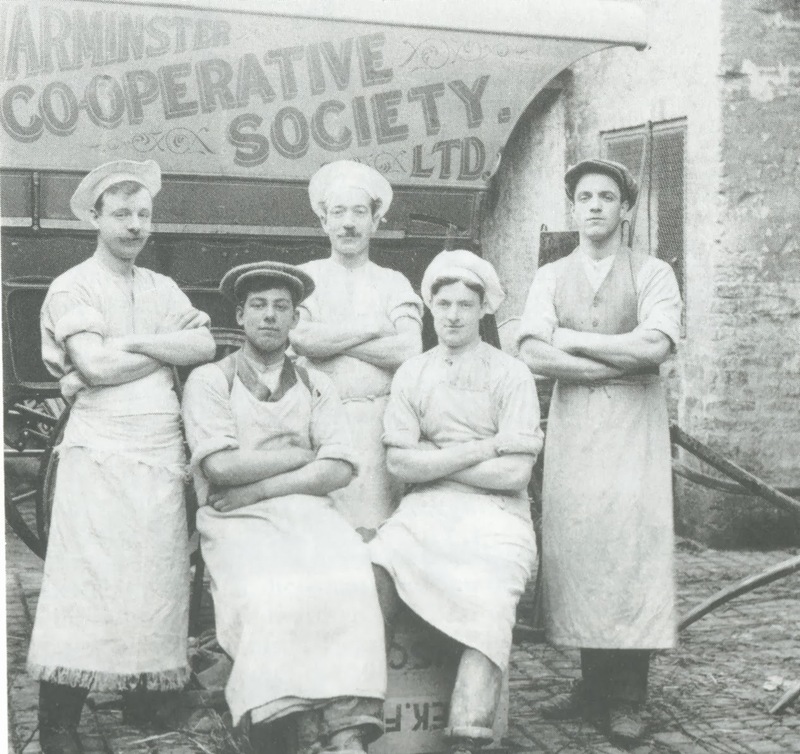 From page 54-55 of the book "At the back of the Market Place store, the Co-op had its own bakehouse, where Harry Barber began working in 1910 when he was 16. He recalled 'Work started at 4 am, baking 40 or 50 loaves at a time and also cakes in two coke ovens, which we filled from the back. We did this over and over again until dinner time, and in the afternoon I pushed a barrow along Portway, Church Street and West Street, selling bread at twopence-halfpenny a loaf. I then went home for a couple of hours until 7.30 pm, when I returned to the bakery to make the dough for the next day. We were really working about 16 hours a day, from four in the morning until nine or ten o'clock at night. 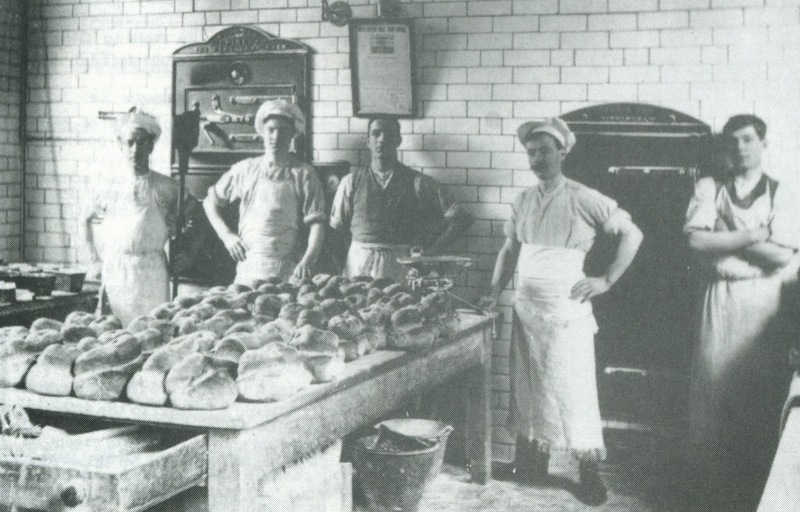 The bakery staff also included Albert Hinton, Walter Compton,Vic Oram and Jack Turner. After baking in the morning, Walter and Vic went out in the afternoon with the horse-drawn vans, delivering bread, and it was nothing for them to go out again at 6 pm, taking bread to the villages like Corton, Codford, Corsley and Crockerton in the evenings'. These pictures must have been taken prior to WW1 as Walter Compton, like many young men, joined up at Devizes in August 1914. He was discharged in November the same year. I have however found a pension record for him. He was a victim of the flu epidemic. Later in the same book there is mention of a family Mr and Mrs Roland Curtis who had 22 children, 3 of whom died. There is quite a long piece about the family who made the newspapers. I will not repeat it all here but Mrs Curtis is quoted as having said"it really does seem as if the bread alone takes up all the money coming in.Three gallon loaves every day! We use up 18 shillings of flour every week. We make the dough ourselves in a tin bath but we send it to the bakehouse to be baked and that costs 2s 6d a week. There's a quarter of a pound of tea every day and one pound of sugar and 1 5d a week for the baby's milk. Most of the tea and sugar is used before six in the morning". For this family bread and tea were the staple diet but for them there was no alternative in the early twentieth century before the days of the welfare state you had to survive on what you could afford. Walter Compton was my mother's uncle and I was not aware of him until I started doing my research. Roland Curtis was Walter's half uncle. When Walter died he left behind a wife and 2 children and another on the way. Times were hard for many after WW1 but both these families will have relied heavily on that staple and versatile ingredient BREAD. Having been born and living in a major port you would expect to find some connection with the sea in the occupations of your family. My grandfather and my father's younger brother however both made a career in the maritime industry as did one of his son in law's. 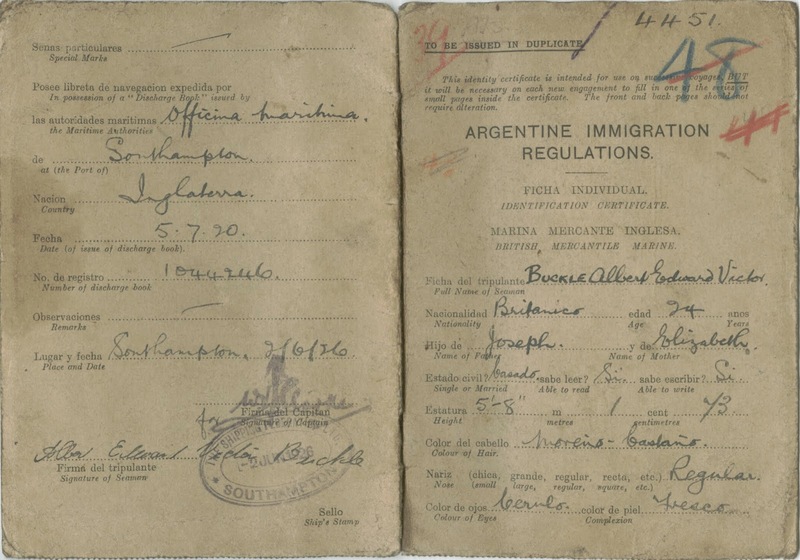 I have been fortunate to have all of my uncle's discharge books and a book of my grandfather's used when he entered Argentina in the 1920's as a merchant seaman on the Royal Mail Steam Packet service. 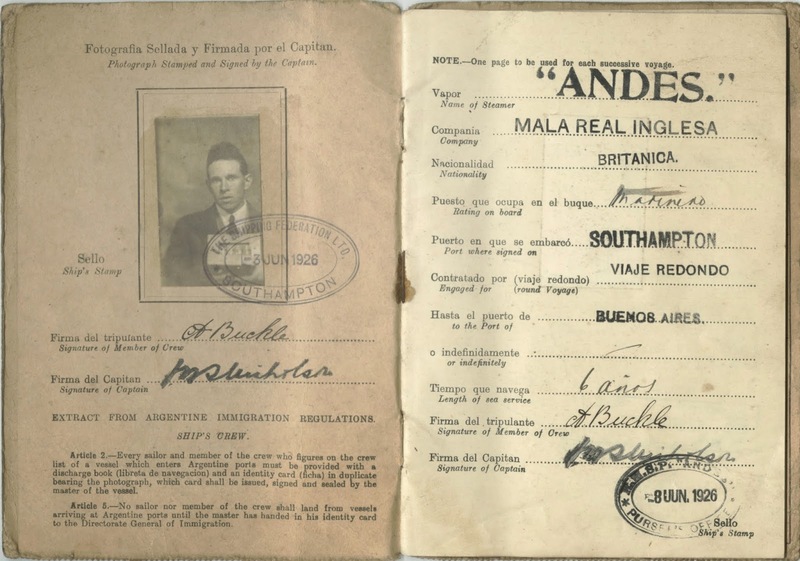 My Uncle worked on the great Cunard liners and I have found him on a number of passenger lists travelling between New York and Southampton. I also have a number of photographs of him taken with other members of the crew and some of the passengers he served as a steward. 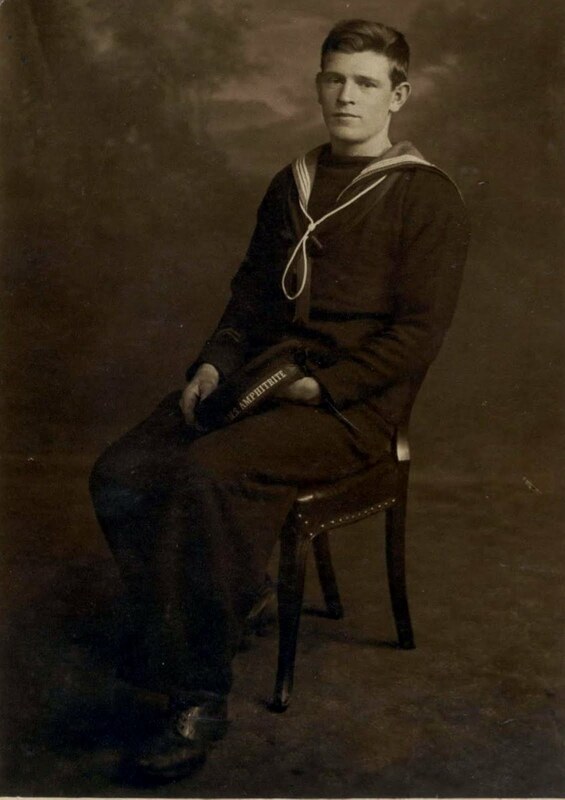 My maternal grandfather had a more shortlived connection with the sea as he served on HMS Amphirite (see photo) during WW1. His step grandfather and fathers half brother also had connections to the sea. His grandmother's husband was a fisherman and his son has been found in Cornwall, Sussex and the Isle of Wight on census night with occupation of mercantile mariner. I have found the following website useful for researching my family in Southampton. There are also sites for some of the other major UK ports which may be useful for others wanting background information on the lives of this maritime ports. I have recently found a naval record for my maternal grandfather so I will be adding another blog post to update this story. My gt grandmother lived in Bitterne Southampton and these are photographs passed down to me. She worked for the family probably helping with the upkeep of the family home. The following article was sent to me by a relation of mine who is related to this person. I decided to post this as this person was the answer to a question in the Radio Times and the name struck a chord with me. I should have known the answer but I didn't twig that this was the same person. Ronald Ross was born on May 13, 1857, as the son of Sir C.C.G. Ross, a General in the English army. He commenced the study of medicine at St. Bartholomew's Hospital in London in 1875; entered the Indian Medical Service in 1881. He commenced the study of malaria in 1892. In 1894 he determined to make an experimental investigation in India of the hypothesis of Laveran and Manson that mosquitoes are connected with the propagation of the disease. After two and a half years' failure, Ross succeeded in demonstrating the life-cycle of the parasites of malaria in mosquitoes, thus establishing the hypothesis of Laveran and Manson. In 1899 he joined the Liverpool School of Tropical Medicine under the direction of Sir Alfred Jones. He was immediately sent to West Africa to continue his investigations, and there he found the species of mosquitoes which convey the deadly African fever. Since then the School has been unremitting in its efforts to improve health, and especially to reduce the malaria in West Africa. Ross' researches have been confirmed and assisted by many distinguished authorities, especially by Koch, Daniels, Bignami, Celli, Christophers, Stephens, Annett, Austen, Ruge, Ziemann, and many others. In 1901 Ross was elected a Fellow of the Royal College of Surgeons of England and also a Fellow of the Royal Society, of which he became Vice-President from 1911 to 1913. In 1902 he was appointed a Companion of the Most Honourable Order of Bath by His Majesty the King of Great Britain. In 1911 he was elevated to the rank of Knight Commander of the same Order. In Belgium, he was made an Officer in the Order of Leopold II. In 1902 a movement was set on foot to commemorate the valuable services rendered to the School of Tropical Medicine by its originator and Chairman, Sir Alfred Jones, by founding a Chair of Tropical Medicine in University College to be connected with the School. The movement was met with enthusiastic support, and an amount of money was quickly collected sufficient to found «Sir Alfred Jones' Chair of Tropical Medicine». Ross was appointed to the Professorship in 1902 and retained the Chair until 1912, when he left Liverpool, and was appointed Physician for Tropical Diseases at Kings College Hospital, London, a post which he held together with the Chair of Tropical Sanitation in Liverpool. He remained in these posts until 1917, when he was appointed Consultant in Malariology to the War Office, his service in this capacity, and in special connection with epidemic malaria then occurring on combatant troops, being recognized by his elevation to the rank of Knight Commander, St. Michael and St. George, in 1918. He was later appointed Consultant in Malaria to the Ministry of Pensions. In 1926 he assumed the post of Director in Chief of the Ross Institute and Hospital of Tropical Diseases and Hygiene, which had been created by admirers of his work, and he remained in this position until his death. He was also a President of the Society of Tropical Medicine. His Memoirs (London, 1923) were «inscribed to the people of Sweden and the memory of Alfred Nobel». During this active career, Ross' interest lay mainly in the initiation of measures for the prevention of malaria in different countries of the world. 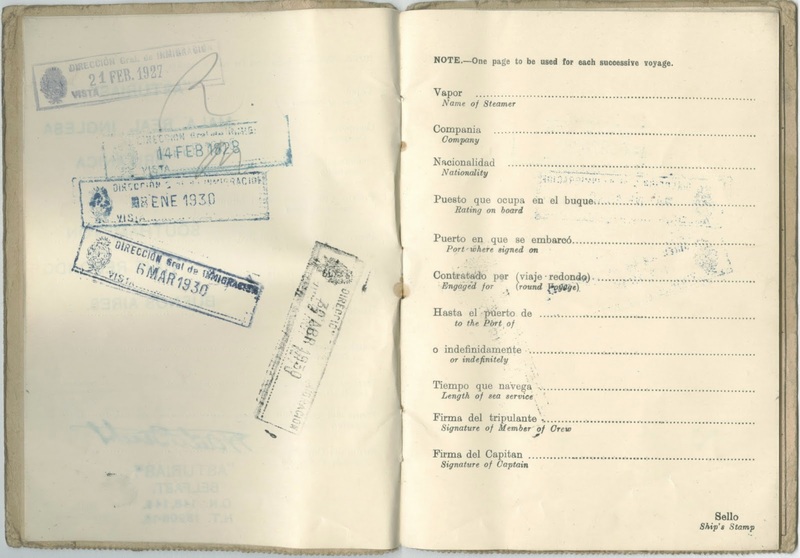 He carried out surveys and initiated schemes in many places, including West Africa, the Suez Canal zone, Greece, Mauritius, Cyprus, and in the areas affected by the 1914-1918 war. He also initiated organizations, which have proved to be well established, for the prevention of malaria within the planting industries of India and Ceylon. He made many contributions to the epidemiology of malaria and to methods of its survey and assessment, but perhaps his greatest was the development of mathematical models for the study of its epidemiology, initiated in his report on Mauritius in 1908, elaborated in his Prevention of Malaria in 1911 and further elaborated in a more generalized form in scientific papers published by the Royal Society in 1915 and 1916. These papers represented a profound mathematical interest which was not confined to epidemiology, but led him to make material contributions to both pure and applied mathematics. Those related to «pathometry» are best known and, 40 years later, constitute the basis of much of the epidemiological understanding of insect-borne diseases. Through these works Ross continued his great contribution in the form of the discovery of the transmission of malaria by the mosquito, but he also found time and mental energy for many other pursuits, being poet, playwright, writer and painter. Particularly, his poetic works gained him wide acclamation which was independent of his medical and mathematical standing. He received many honours in addition to the Nobel Prize, and was given Honorary Membership of learned societies of most countries of Europe, and of many other continents. He got an honorary M.D. degree in Stockholm in 1910 at the centenary celebration of the Caroline Institute. Whilst his vivacity and single-minded search for truth caused friction with some people, he enjoyed a vast circle of friends in Europe, Asia and America who respected him for his personality as well as for his genius. Ross married Rosa Bessie Bloxam in 1889. They had two sons, Ronald and Charles, and two daughters, Dorothy and Sylvia. His wife died in 1931, Ross survived her until a year later, when he died after a long illness, at the Ross Institute, London, on September 16, 1932. Both of my mother's parents had several siblings and even though Mum was 30 when I was born I would have expected to have known most of them. My grandmother was the youngest of 5, the only girl, she was orphaned at a young age and was then brought up in an orphanage. She did not lose touch with her brothers, but my mother and I only ever knew one of them. In researching my family this is what I found. Her eldest brother who she lived with for a while married and had children he joined the army when WW1 broke out but was discharged as not being considered suitable to be an efficient soldier. However he never saw his youngest child as he died in the influenza epidemic in 1918. Her brother Sidney was killed in WW1 and is mentioned on the CWGC site. Her brother Ernest Roy was also lost during WW1 but I have been unable to confirm this as the only possible a Roy COMPTON born Warminster has no age recorded and no parents names. My grandfather's side of the family was much larger. He was one of eight. Four girls and four boys. Two of his brothers were too young to serve in WW1 and both his older brother and he survived the conflict. I never met my grandfather as he died 2 years before I was born. His older brother died the year I married but I have little recollection of him. Of his 2 younger brothers the youngest was killed in a road traffic accident before my mother was born and she would not have known him and the other remaining brother was a guest at my wedding being the only remaining member of his generation in that part of the family. Even in my generation I have not known all of my uncles as one of my mother's brother's died the day before her twelth birthday having been involved in a road traffic accident the previous month. This only goes to show how much world events and tragic accidents can impact on our own families. I have been looking at the 1911 census and have found out more about what happened to the family of Edward Rosling and Rebecca Ellis. 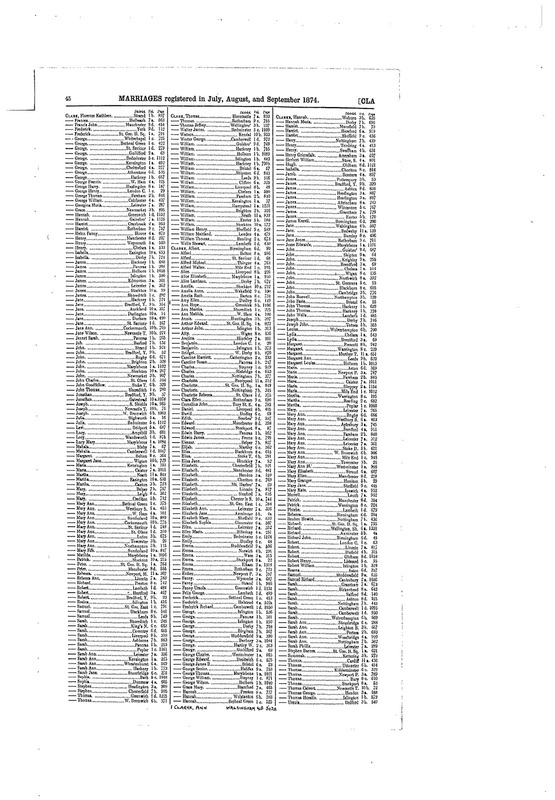 Further to my previous post about Annie Rosling I have now found both her sons on the 1911 census. George was living with his grandparents in Swinstead, Lincolnshire. Walter I found in Horley, Surrey. He is listed as visitor but he is actually nephew. The head of the household Charles Edward Duvall a signalman was married to Eliza born in Swinstead. Eliza is the sister of Annie. The family has 2 sons cousins to Walter. Peregrine Rosling was in Great Grimsby in 1901 but has now moved to London. He is to be found in Cavendish Square and is Butler to opthalmic surgeon Henry Edward Juler. Meanwhile his brother William has married and is still living in Swinstead employed as a traction engine driver. He has 2 sons and a daughter and his second son has continued the family tradition having been given the name Peregrine. Annie Rosling was the sister of my husband's gt grandfather. I have just been able to confirm the identity of her husband. I found a possible marriage for her some time ago, but as it was prior to the date when they gave the surname of the spouse in the index I was not sure if it was the correct marriage. I found out from one of her descendants that she had several children born out of wedlock. 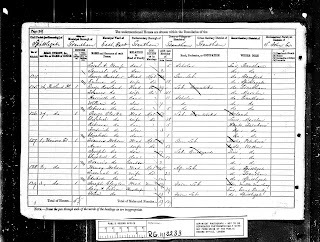 Annie had 3 children by the time of the 1901 census and the 2 eldest, both boys, were living with their grandparents. 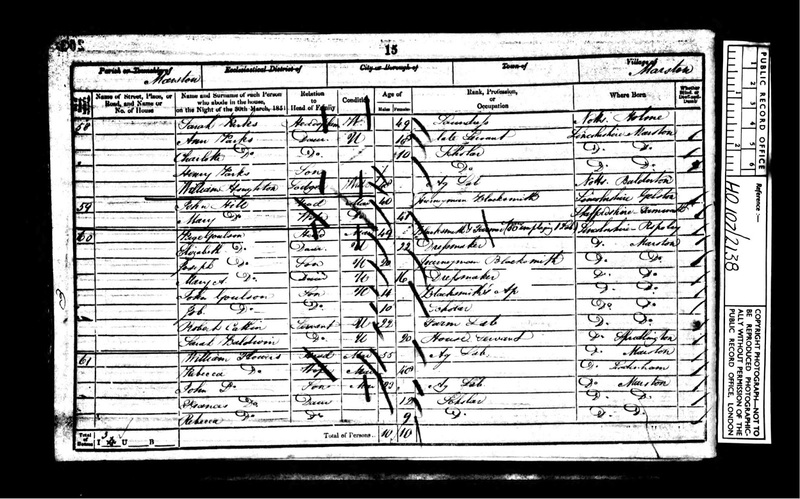 By the time of the 1911 census she had married and her youngest, Mabel, appears to have taken her stepfather's surname. She had also given birth to at least 2 more children a daughter Elder aged 5 (this could be Hilda Fanny from the GRO Indexes) and Gladys aged 4. 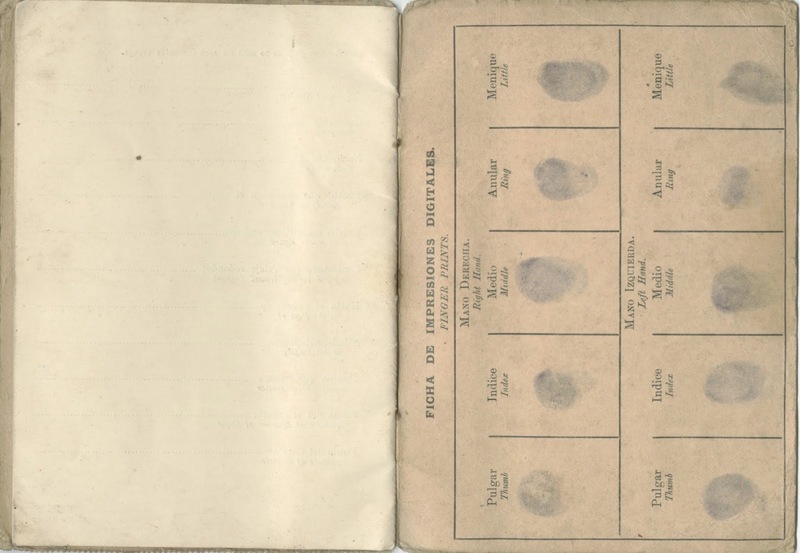 The census also states that she had 7 children from this marriage, 6 of whom were still alive and they had been married 6 years. The figures don't add up as she had 3 children prior to the marriage that we know about and he had 3 from his first marriage. 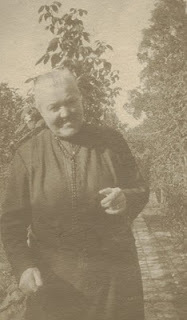 Her husband had been widowed in 1903 and left with 3 children to bring up, the eldest being only 11 years old. The following year he married Annie Rosling. They had 2 children from their marriage still with them and there was a possible child who was born and died in Mar 1911 quarter Edward H Crowson. The really interesting thing is that Alfred Crowson, the groom, was Annie's sister in law's brother. Robert Rosling married Emma Crowson (they are my husband's gt grandparents). Alfred Crowson married Annie Rosling these 2 being siblings of my husband's gt grandparents. The children and descendants of both couples will share this same line of ancestors. 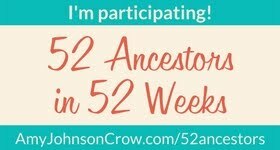 Over the years I have been researching my family tree like most people I have made several great finds and every time you find that elusive piece of information you get that urge to shout out Yes!! If I were to pick out one find which I found really interesting and have still not managed to follow up completely it would be the one I found after trying to find out whether any record existed regarding the parentage of my gt gt grandfather whose parents were not married according to his baptism. I emailed the archive in Southampton, Hampshire, England to ask if any bastardy records existed for his baptism year of 1827. 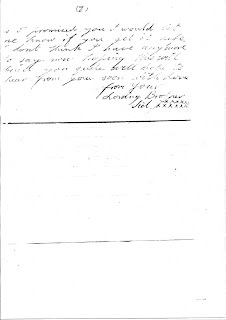 They sent me a very helpful reply stating that whilst they had no records relating to bastardy for that period they did have in their card index a reference to a settlement examination for a Louisa Richards (this was his mother's name) in that same parish in that year. My next visit to Southampton I determined to follow this up as I thought it might hold some clue to where she was from and then possibly her parentage. The document was ordered and I looked up the page given on the card. All this told me was that she did not know where she was born. Was my luck running out? I then noticed at the bottom of the page there was a reference to another page. I turned to this page and read the examination for her mother regarding Louisa's place of birth. Now we get to the really interesting bit. I have found what I believe to be the marriage of Mary to Edward Eley, she appears to have given her maiden name when she married by licence. I then found a baptism in Milbrook, Southampton for about the right date for this to be her, and also found baptisms for her siblings, and her parents marriage. I believe her father came from Titchfield and there are family of this name in the area. But what must be the biggest coincidence, and one which I must follow through, is that her mother's maiden name was WAITE and my sister married a man whose family were from this same area with the surname WAIGHT. I still need to confirm the marriage in Jersey. But I never thought that I would find so much out from 1 piece of paper. Below is an update on the earlier post. I have been trying to find Thomas Richards on the Army Records at Find My Past but could only find one in the 75th rather than the 76th. However this weekend I found a record for a Thomas Richards in the Peninsula Medal Roll and realised that the 76th Foot was the Duke of Wellington's Regiment. I also found the regimental museum website, as the museum is in Halifax I hope to visit next time we are in Yorkshire to see what I can find out about where he fought and possibly where he was born. 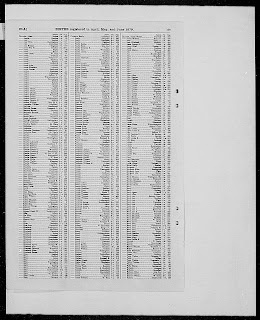 My first blog for this new year has to be about the long awaited release of the 1911 census. I was able to take advantage of the beta release over the Christmas period and managed to find some of the family. Not all of the counties I wanted were available but I found some of the family. Tonight I was able to find the WARD family from Norfolk as Lincolnshire was available. They had moved to Stamford which I had suspected when I was unable to find them in Norfolk. Now I will send for the death certificate I had found in Stamford in 1917 as it is likely to be for Charles Henry WARD who I know died before 1920 when his wife Eliza remarried. I have found 3 more sons for this couple and they also had 2 children that had died who had not made it to any census. 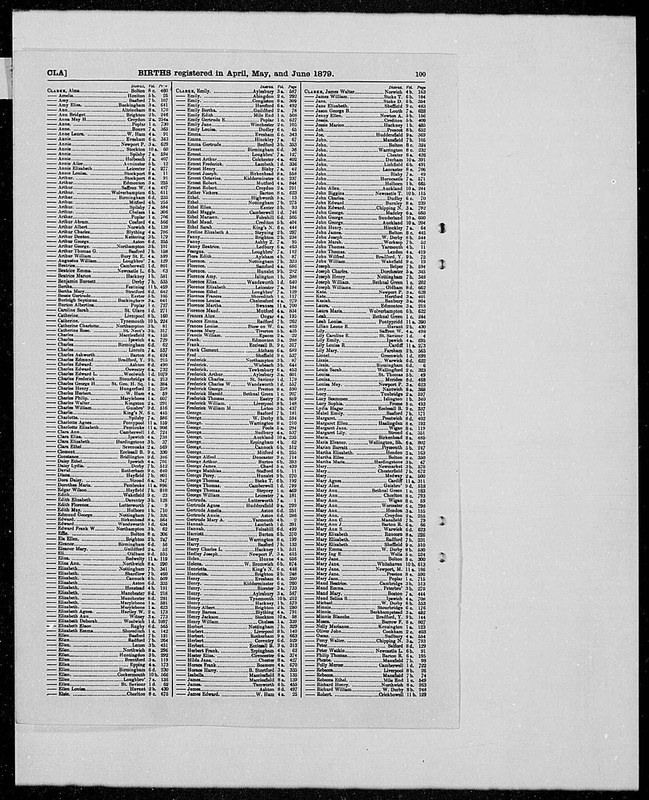 If you have not had chance to view the 1911 census then I suggest you do the images are not cheap but they are your relative's own handwriting and they tell us more than any of the earlier censuses have done. As a postscript to this I still have to determine who the missing children were as they did not appear in any census. I knew that my grandmother was orphaned and when I was given a copy of her records from the orphanage this set me on a quest to find out more. The letter written to the orphanage showed that her mother had taken her own life. I knew when this had happened so I tracked down a copy of the local newspaper at the local studies library. I found two items in the newspaper. The first was a simple report of the death. The second report detailed what had been said at the coroner's inquest. The worst of it was that her sons had found her when they went down in the morning to get a light before going to work. 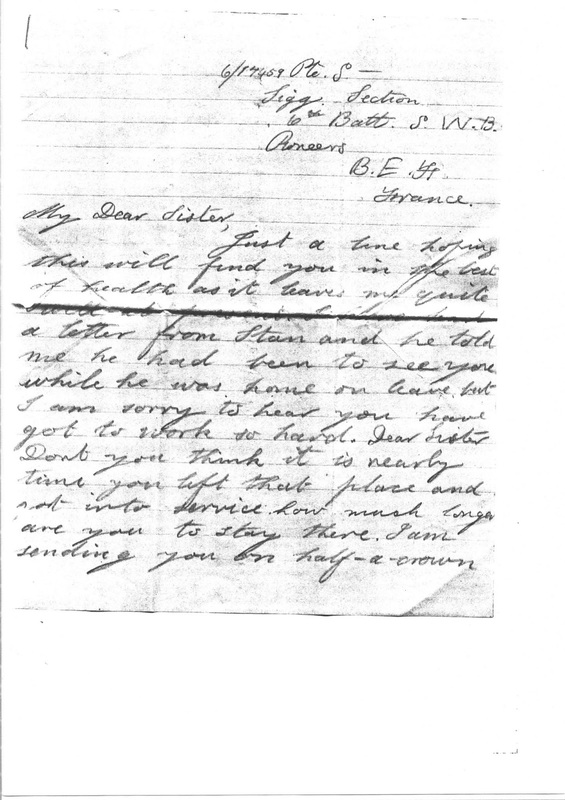 The one who found her was later killed whilst fighting in WW1 and his brother died during the flu epidemic. I will never know what effect this had on them and until I was an adult I was unaware that my grandmother had more than 1 brother (she had 4). Even though I did not know these people personally it was an emotional experience finding out what happened to my gt grandmother. Further to my post on the 17th I received this message from one of my contacts Yvonne Parker a relation of my husband from his FLOWERS line. 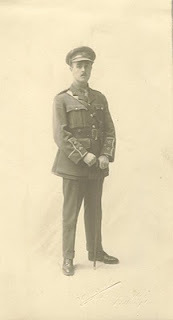 "I have just been looking at your blog, having just returned from holiday and saw your 17th June entry regarding the Flowers/Lawson connections to the Gadsby line. Joseph Flowers (b1855) married Elizabeth Lawson (b 1857) in 1875, the marriage was registered in Newark. They had four children as far as I am aware - Edith Ann 1875 - 1881, Sarah Ellen b 1877, Eliza 1879 - 1882 and Louisa b 1880. The family were in Freeby, Leicestershire on the 1881 census but little Eliza's death was registered in 1882 in Sleaford. 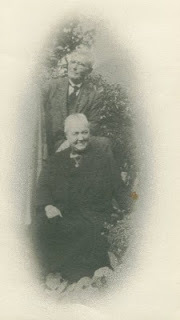 The connection with your Gadsby line comes from the fact that Joseph Flowers was the eldest son of John Flowers 1828 - 1913 whose parents were William Flowers and Rebecca Lawson." 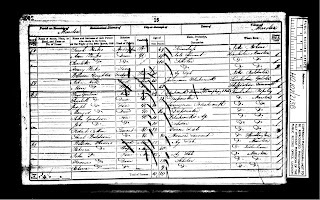 Edward Ward the son of Richard Ward and Mary Gray married Ann Ellen Lawson in the Newark district in the Dec quarter of 1875 according to the GRO indexes. Anne's sister is Elizabeth Lawson who married Joseph Flowers. Interestingly Mary Gray was born in Marston which is where Eliza the daughter of William Flowers and Rebecca Lawson was born. I will let you know if I find out more about any Lawson connection. Is this just a Coincidence!! I was looking to confirm the parents of a child found on the census with the grandparents, Richard and Mary WARD, who are my husband's 3xgt grandparents. 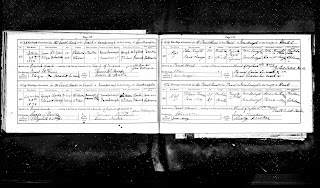 The mother was also with the grandparents so I was looking to find her with her husband on an earlier census and then to confirm their marriage and her maiden name. I discovered her maiden name was LAWSON and although this is not a particularly common name I already have this name in another part of the tree for the other line of my husband's ancestry. Given that there is already a link to this surname I wanted to see if they were related. I went on to do more searches in the censuses and found that the wife's father had been born in Foston Lincolnshire. Having found the wife's mother on a later census with her grandaughter Ellen FLOWERS I was even more intrigued. In my husband's GADSBY line his gt gt grandmother was Eliza FLOWERS daughter of William FLOWERS and Rebecca LAWSON she was born in Marston Lincolnshire and the youngest of her children was born in Foston Lincolnshire. It turns out that the parents of Ellen FLOWERS were Joseph FLOWERS and Elizabeth LAWSON. I have not managed to find out how or if they are related to his GADSBY ancestors but given the geography I feel certain that they will be related. This is not the first time I have found relations on one line who could be related to others on another line as my husband's Norfolk ancestors are possibly relations to others found on his Lincolnshire/Leicestershire line. I will post again if I find anything more. On the 1st June my 3rd cousin Tim Green and his wife Ruth celebrated their 40th Wedding Anniversary by renewing their vows at Bitterne Parish Church. I was fortunate to be able to attend the service and finally meet up with Tim who I have been corresponding with by email for several years. I took a few photographs and later this year I will write a short piece for the Bitterne Local History Society magazine. I will also post a copy of this on my blog. 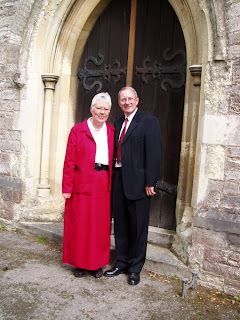 This photograph was taken on their 40th Wedding Anniversary outside the church where they married. The SMITH line has grown this year and thanks to Paul SMITH making contact with another descendant of James SMITH I also have scanned copies of photographs of Fanny SMITH aged about 19 in about 1891 and a group photograph of other members of her family. The group consists of James, his mother Mary Ann, his son James, Emily CARRINGTON wife of the younger James, their daughters Lilian and Florence and Edith Fanny's sister. This photo was taken about 1901 and Mary was born about 1817. 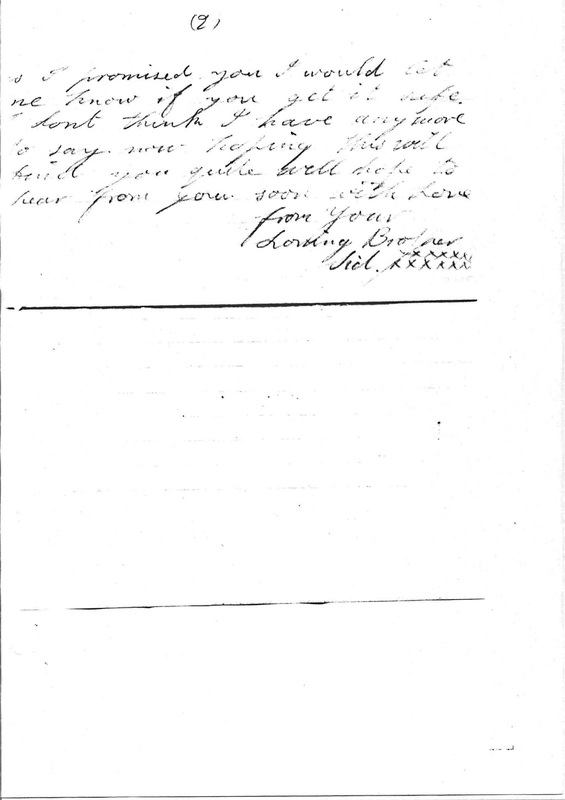 The IGI has possible ancestors for Mary which will need confirming but assuming the family stayed in Bulkington and the transcriptions are correct we may have them back to late 17th century. Hannah's father proves somewhat elusive. Her mother was widowed in 1838 and Hannah was born 1846 some 6 months before her mother's marriage to William ELLIS. Maria, Hannah's mother, also had 3 more children before Hannah and after the death of her first husband none of whom were her first husband's offspring. She had 4 children with her first husband John CHAMBERLAIN and had at least 1 more George ELLIS. 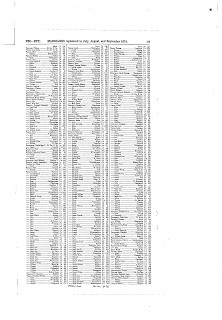 On the 1881 census they are using the surname Messenger and this has been added as a middle name on the 1871 census. There were several grandchildren on the census who appear to be children of an unmarried daughter so at least one of them followed in mother's footsteps. As promised I shall continue with some of the breakthroughs this year. On the GADSBY branch I have not managed to progress further forward and am still hunting for proof as to the parentage of Nathaniel GADSBY who was born about 1787 in Lincolnshire. I have been unable to find a death registration for him and his exact place of birth remains elusive. I have found out more about the family of Clarissa GADSBY who married Stephen James BLYTHER via a genesreunited contact. One of my early GADSBY contacts has been back in touch and I have updated her with my finds and other shared information. A descendant of Mary Ann GADSBY has been in touch and has helped fill another gap. I have also made some progress with the ELLIS family and had a couple of contacts with ROSLING connections so that some of the side shoots are filling out. The WARD side of the family has had some shakeup this year. Having found a possible link to family who emigrated to Australia it was then realised that the Richard WARD who married Mary GRAY was not the son of William and Catherine WARD but the illegitimate son of Catherine WARD. Catherine's parentage and marriage to Joseph PATCHETT in 1812 is well documented and Richard had a number of siblings from this marriage. This has also lead to the discovery of WARD ancestors as early as 1676 as the WARD family stayed in Croxton Kerrial for centuries. It is quite likely that there are still descendants from this line in the village today. From having been stuck with the couple William and Catherine the tree now goes back another century. Thanks to the hard work of Paul SMITH who transcribed some of the Croxton Kerrial parish records many dates have been filled in on this WARD line. I will continue with the SMITH and the Norfolk WARD family on the next post. This year there have been a few developments on the family tree I will list some of those that I can remember if anyone can add anything more please let me know or if I have missed anything important. I will start with my BUCKLE line. This last year has seen 2 of this line leave us. My mother in May and my father's eldest sister last month. I have found a possible marriage for Mary, the maternal grandmother of Stephen Richards BUCKLE, to Edward ELEY in Titchfield. This has lead me to believe that her maiden name was BUCKETT and I have found a possible christening in Millbrook and parents and siblings. This also fits with Mary's father having been born in Titchfield. Her mother was a WAITE whose family may also have connections to the Titchfield area. On my next research visit I intend to look further into the Titchfield link, especially the WAITE family as my brother in law is a WAIGHT from this general area. My sister might find she was already distantly related to her husband. I have filled in some gaps in the Warminster COMPTON family after making contact with the daughter of my second cousin. Another cousin has found information on the earlier COMPTONs at Fisherton De La Mere and I now have mother's maiden names for 2 more of the ancestors pre general registration. It also appears that one of the son's of Richard TOOMER and Sarah LODGE in the Salisbury area was involved in the Swing Riots and subsequently transported to Australia. He returned to England on being released and married however the only child of this union died before reaching adulthood. I will continue the remaining GADSBY and WARD lines on my next blog. If you wish to view my tree don't forget Tribal pages user id gadsby visitor password pharmer.